Stories and tips for mums going it alone. What happens when three worlds collide - Christian, psychologist and sole parent? 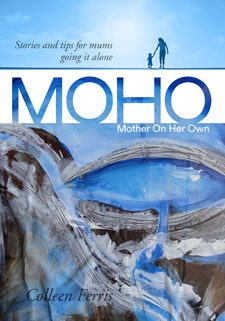 MOHO happens. Colleen Ferris brings together her knowledge and experiences from these three perspectives to provide a book that will strengthen you in your parenting journey. If you are a mother on her own, inside this book you will find short stories (because who has time for long stories, right?) that might just resonate with exactly where you're at. Following each story, Colleen explores the real life thoughts, experiences and challenges of being a Mother On Her Own, providing down-to-earth Jesus-centred insights drawn from her psychology and counselling expertise. Wherever you are on your Christian walk and in your life as a sole parent, there will be a lesson, or a tip that will move you forward. Colleen is a born and bred Queenslander with a surprising passion for cold places, mountains and tramping/trekking. She recently spent two years living in the South Island of New Zealand to fulfil that passion. Growing up, she dreamed of being a writer, and now after 20-something years as a psychologist and many years as a sole parent, that dream has become a reality. Colleen loves to encourage people to reach their true created potential and plans to spend the rest of her days doing just that.